Two universities ask journal to retract paper that allegedly violated a collaboration agreement. 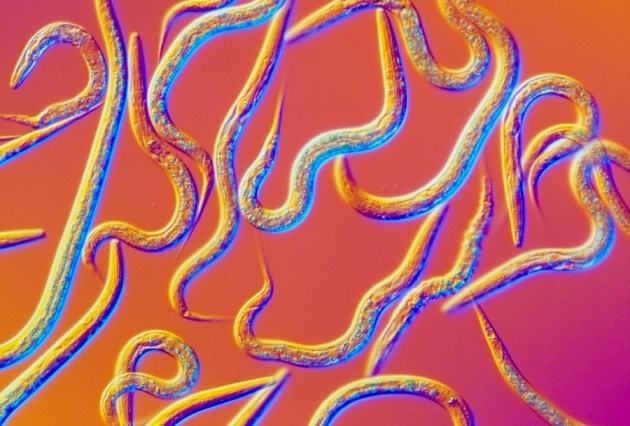 Neuroscientists in China say they have used magnetic fields to control neurons and muscle cells in nematode worms (pictured), after identifying a protein that senses magnetism. A dispute has broken out at two of China’s most prestigious universities over a potentially groundbreaking discovery: the identification of a protein that may allow organisms to sense magnetic fields. On 14 September, Zhang Sheng-jia, a neuroscientist at Tsinghua University in Beijing, and his colleagues published a paper1 in Science Bulletin claiming to use magnetic fields to remotely control neurons and muscle cells in worms, by employing a particular magnetism-sensing protein. But Xie Can, a biophysicist at neighbouring Peking University, says that Zhang’s publication draws on a discovery made in his laboratory, currently under review for publication, and violates a collaboration agreement the two had reached. Administrators at Tsinghua and Peking universities, siding with Xie, have jointly requested that the journal retract Zhang’s paper, and Tsinghua has launched an investigation into Zhang’s actions. The dispute revolves around an answer to the mystery of how organisms as diverse as worms, butterflies, sea turtles and wolvesare capable of sensing Earth’s magnetic field to help them navigate. Researchers have postulated that structures in biological cells must be responsible, and dubbed these structures magnetoreceptors. But they have never been found. In research starting in 2009, Xie says that he used a painstaking whole-genome screen to identify a protein containing iron and sulfur that seems, according to his experiments, to have the properties of a magnetoreceptor. He called it MagR, to note its purported properties, and has since been examining its function and structure to determine how it senses magnetic fields. While Xie waited for his paper to make it through peer review — a process that started in December 2014 — a handful of groups initiated collaborations with him in hopes of using MagR as a research tool. He shared the protein, related biological materials and data, on the condition that other groups would let him publish his discovery first and include him as a co-author in their papers. “I never really worried about it because we all agreed that the paper determining the protein should be first,” says Xie. Xie shared information and biological materials with Zhang, but the two contest the details of their agreement. Zhang says that he agreed to Xie’s conditions, but that Xie also promised not to share the data with anyone else. And Zhang says that after he heard that Xie had “leaked” his data, he felt that he no longer needed to honour the agreement. But Xie says that he made no such promise to Zhang. “Why would I?” he says. Xie says that he was collaborating with another Tsinghua University neuroscientist, Lu Bai, and shared information with Zhang because he mistakenly believed that Zhang was part of Lu’s research team. He said that he gained that impression after Zhang accompanied Lu’s student on a visit to Xie’s lab in April. Zhang, meanwhile, says that he and Xie had forged an agreement independent of Lu, something Xie denies. Approached for comment, Lu says that Tsinghua has asked him not to discuss the matter — but documents seen by Nature show that the university has launched an investigation into Zhang’s actions after Lu complained that Zhang stole his research materials and ideas. The contents of Zhang's paper have sparked debate and some doubt. In the work — which was submitted on 9 September, accepted on 11 September and published three days later — Zhang uses the same protein that Xie had identified, but calls it MAR, not MagR. He reports experiments using magnetic fields to manipulate cells engineered to express the protein. For example, by engineering worms to have MAR active only in muscles, he uses magnetism to make their muscles contract. And by engineering them to have MAR only in certain neurons related to sensitivity to touch, he reports that magnetic fields made the worms withdraw, as if reacting to physical touch. The report is preliminary, but shows the potential of using the protein and magnetic fields to stimulate neurons, says Mu-ming Poo, director of the Institute of Neuroscience at the Chinese Academy of Sciences in Shanghai. But he and other researchers are critical that the paper does not discuss how the protein can sense magnetic fields. James Chou, a biological chemist at Harvard Medical School in Boston, Massachusetts, says that the work offers no reasonable explanation — or even speculation. “They don't really seem to understand why this protein appears to be magnetic,” says Peter Hore, a biochemist at the University of Oxford, UK. He says that the description of the protein central to the experiment is inaccurate. The paper speculates that the proteins form as “magnetosomes”. But Hore points out that this is a term generally used for structures composed of magnetic minerals, rather than proteins. “They’ve confused a cluster of iron and sulfur atoms in a protein with a mineral that contains no protein at all,” he says. Zhang concedes that he is unclear on how the protein might work. But he says that the important thing is that “we know how to trigger robust activity with this magical molecule”. The paper has three other co-authors, whom Zhang says are all his graduate students. Nature has not been able to contact them, and Zhang has refused to provide their e-mail addresses, saying that he had to check with the university whether it was OK to do so. In an e-mail seen by Nature, administrators from Tsinghua and Peking universities say they have asked the journal to retract Zhang's publication. They say that by proceeding without Xie's permission, Zhang's paper "violated academic norms". Asked for comment, editors at Science Bulletin acknowledged receiving the message, but said that their actions “will depend on the results of the investigation provided by the institutions”. The journal is co-published by Science China Press and Springer; a spokesperson for Springer said that the publisher was currently looking into the matter and had no further comment to make at this time. Zhang told Nature that he thinks his research will win a Nobel prize. He says that he was justified in publishing the results because Xie’s work was merely biochemical identification, whereas he had the idea of using magnetic fields and the protein to control cells. Xie says that this idea is obvious, and that he included it in a patent he applied for last year. Whatever the result of the dispute, scientists whom Nature has spoken to are excited by the prospects of finally identifying a magnetoreceptor in cells. “To know the molecular basis of using proteins to sense magnetic fields would be incredible!” says Chou. The original version of this text contained a phrase that could have raised questions over who identified the magnetoreceptor protein. That phrase has now been removed. Long, X., Ye, J., Zhao, D. & Zhang, S.-J. Sci. Bull. http://dx.doi.org/10.1007/s11434-015-0902-0(2015).